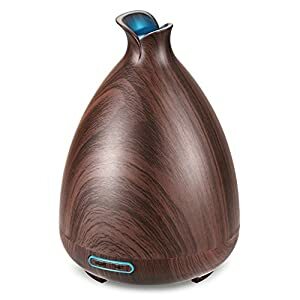 $44.95 (as of April 19, 2019, 11:20 am) & FREE Shipping. 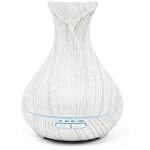 PREMIUM ESSENCE DIFFUSER – Our Essence Diffuser has a 400 ml capacity and uses state of the art wave diffusion technology to atomize essential oils for ultimate wellness. 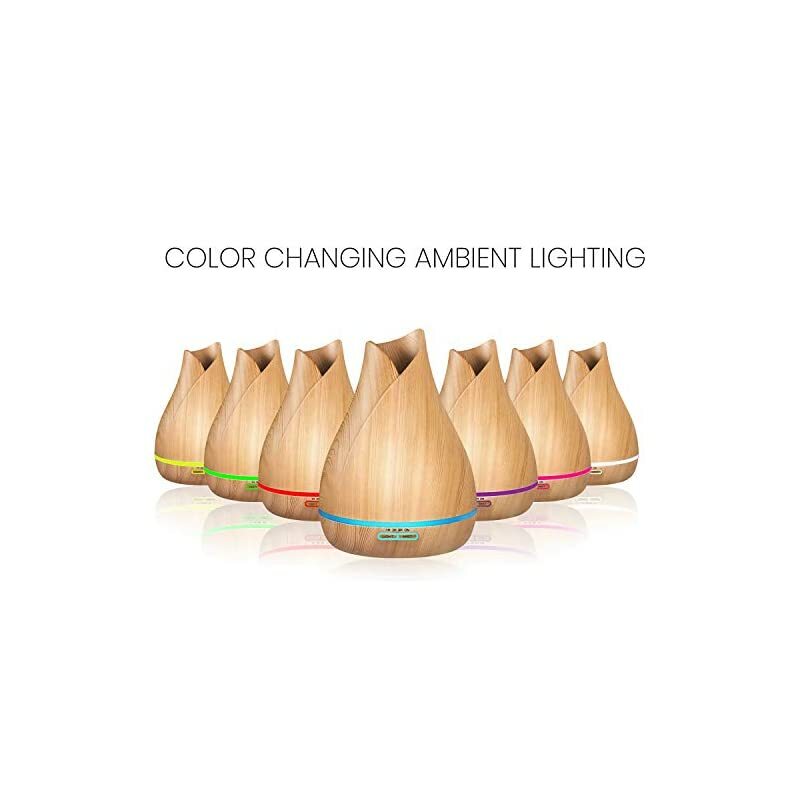 The Essence diffuser includes 7 ambient light modes with two intensity settings for 14 different light combinations. It also includes 4 timer settings and a convenient auto shutoff feature for low water levels. 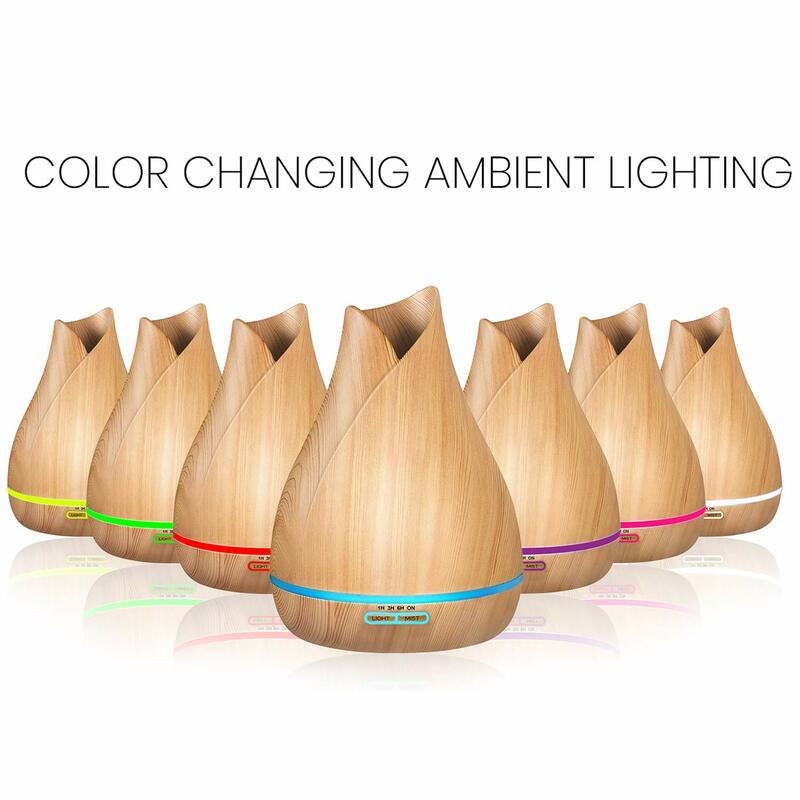 Essence is made of BPA free plastic with a beautiful printed wood grain design. ANCIENT FORMULAS PROVEN RESULTS – Our oils are formulated using the highest quality plants, such as lavender from France, Indonesian Cumin and Roman Chamomile. 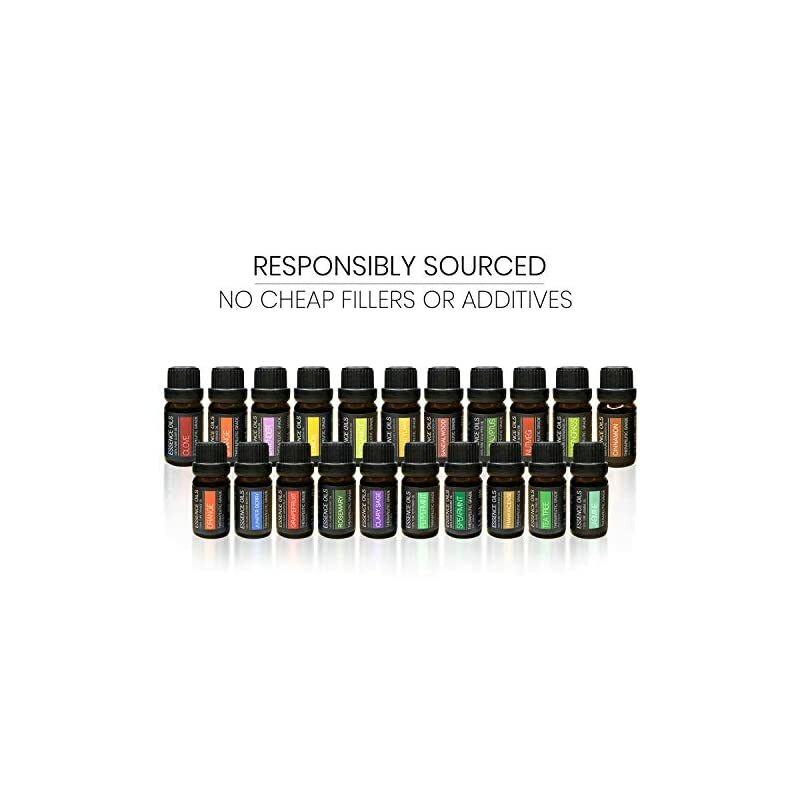 Our Pure oils are just that; pure. 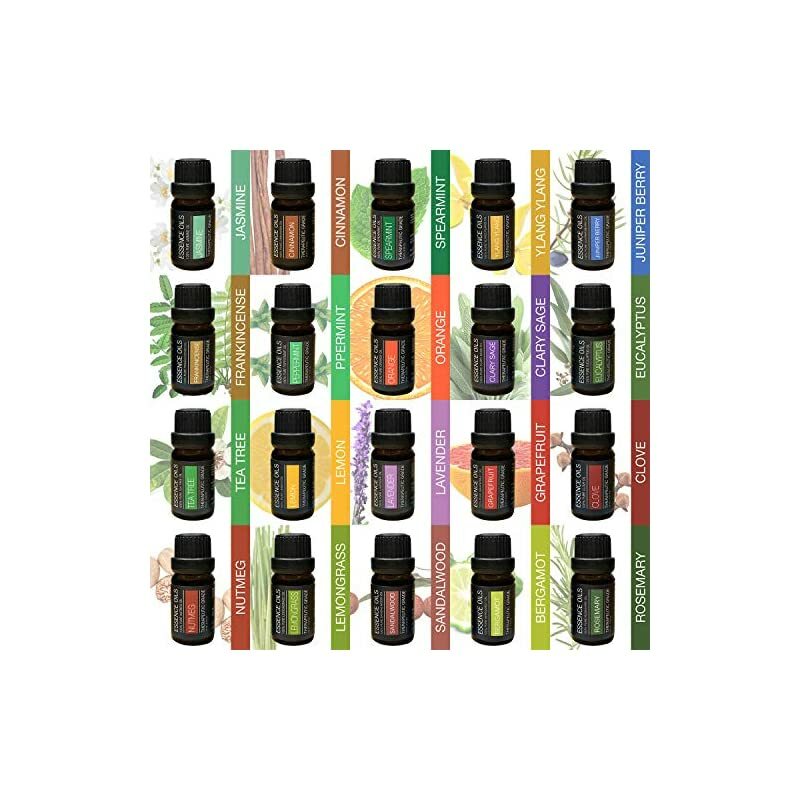 Our oil blends mix specific ratios of our 100% pure oils to create powerful effects on mind, body and overall well being. 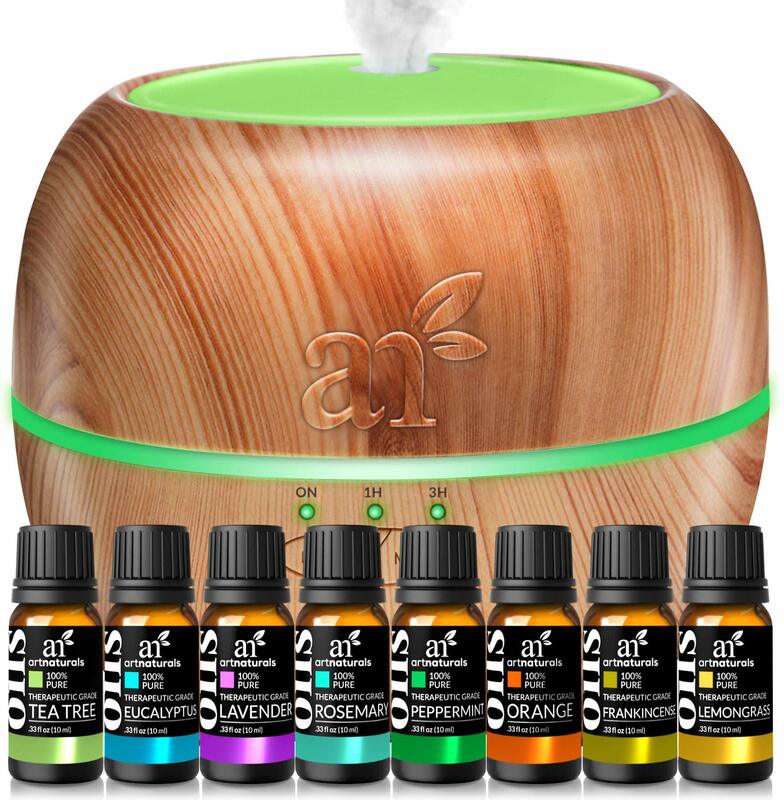 Our oils have no added fillers and absolutely zero additives. 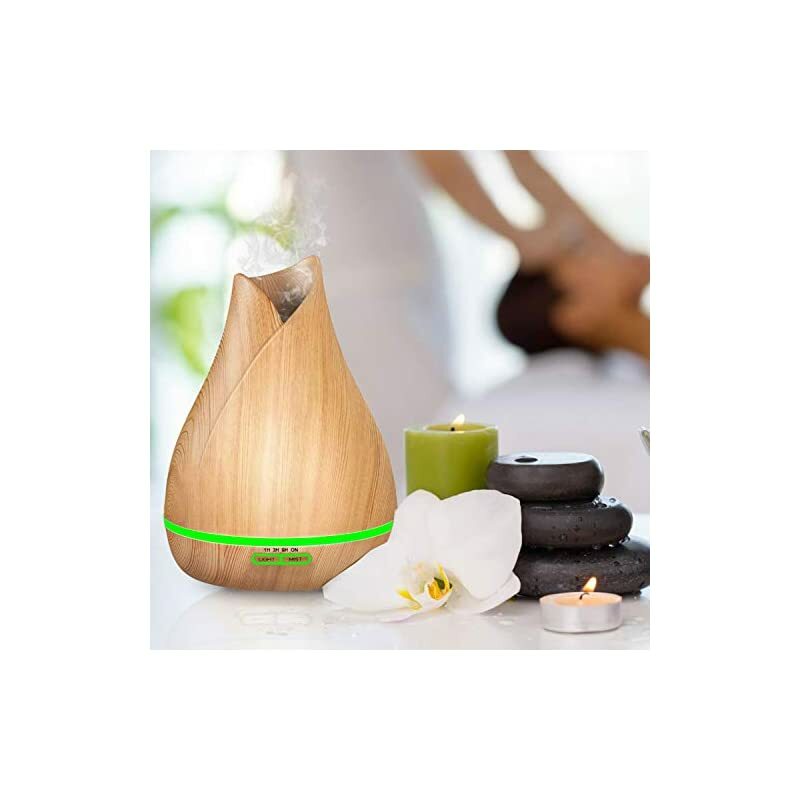 We use whole leaf and root of various common and rare plants and extract their rich aromatic oils for use in our sets. 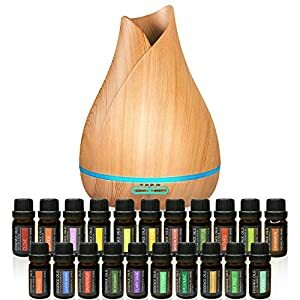 TOP 20 Pure Essential Oils – Our 20 oils included are lavender, eucalyptus, tea tree, orange, peppermint, lemongrass, jasmine, nutmeg, clove, spearmint, Frankincense, Cinnamon, Lemon, Sandalwood, Ylang Ylang, Clary Sage, Grapefruit, Bergamot, Rosemary, and Juniper Berry. 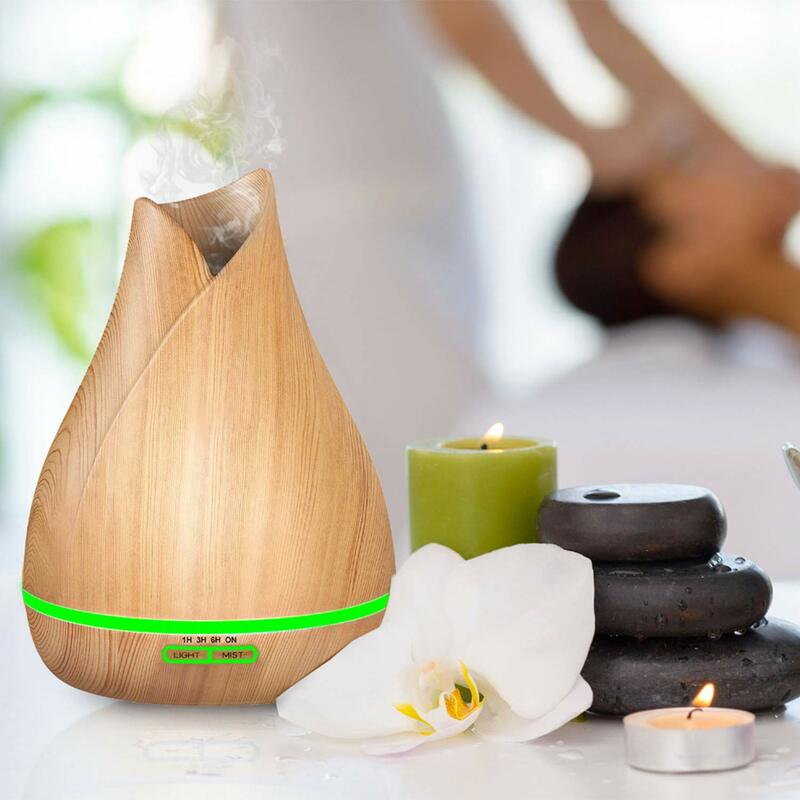 PREMIUM ESSENCE DIFFUSER – Our Essence Diffuser has a 300 ml capacity and uses state-of-the-art wave diffusion technology to atomize essential oils for ultimate wellness. 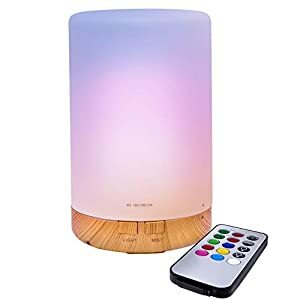 The Essence diffuser includes 7 ambient light modes with two intensity settings for 14 different light combinations. It’s also 4 timer settings and a convenient auto shutoff feature for low water levels. 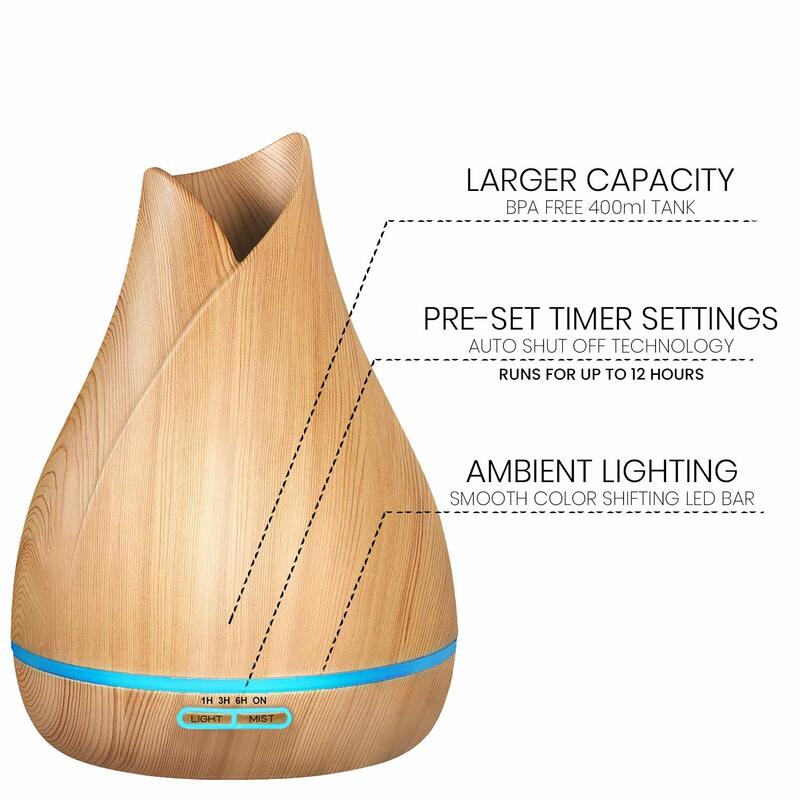 Essence is made of BPA free plastic with a beautiful printed wood grain design. 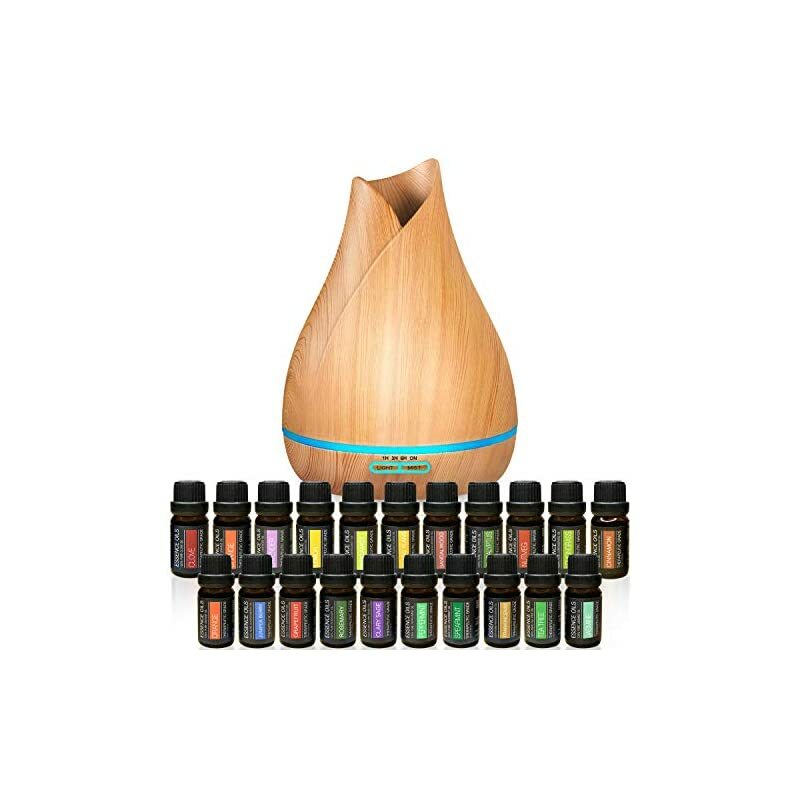 TOP 20 100% Pure Essential Oils – Our 20 oils included are lavender, eucalyptus, tea tree, orange, peppermint, lemongrass, jasmine, nutmeg, clove, spearmint, Frankincense, Cinnamon, Lemon, Sandalwood, Ylang Ylang, Clary Sage, Grapefruit, Bergamot, Rosemary, and Juniper Berry. PREMIUM ESSENCE DIFFUSER – Our Essence Diffuser has a 400 ml capacity and uses state-of-the-art wave diffusion technology to atomize essential oils for ultimate wellness. 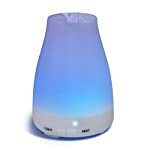 The Essence diffuser includes 7 ambient light modes with two intensity settings for 14 different light combinations. It’s also 4 timer settings and a convenient auto shutoff feature for low water levels. 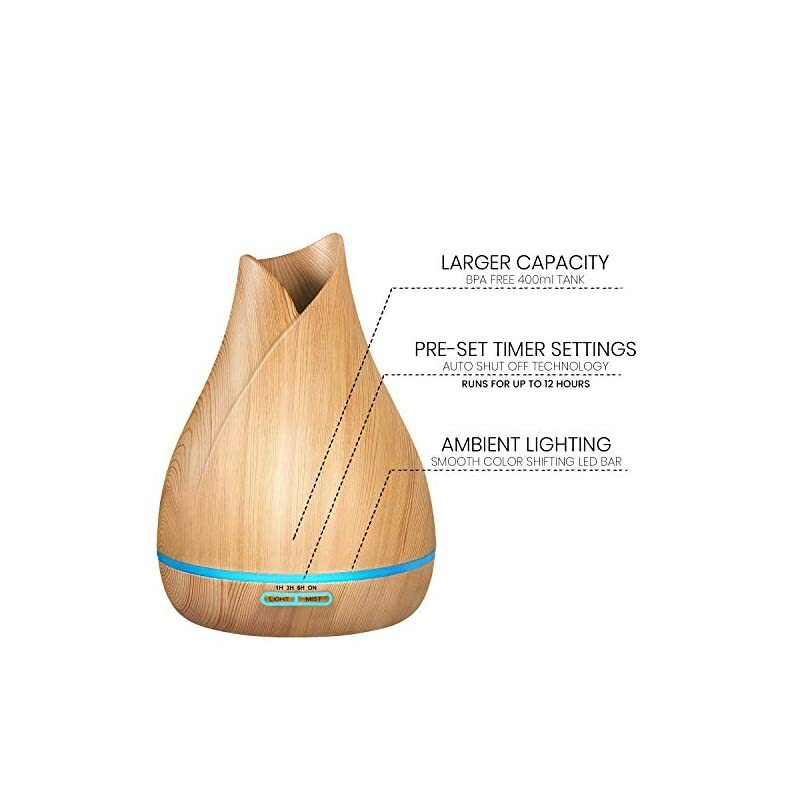 Essence is made of BPA free plastic with a beautiful printed wood grain design. 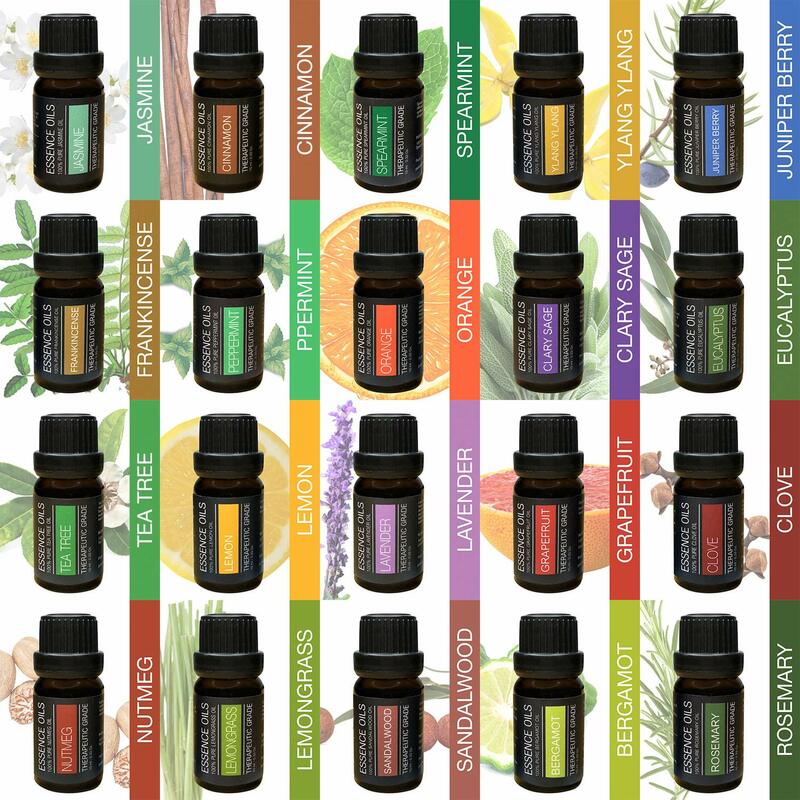 ANCIENT FORMULAS PROVEN RESULTS – Our oils are formulated the use of the best quality plants, such as lavender from France, Indonesian Cumin and Roman Chamomile. Our Pure oils are just that; pure. 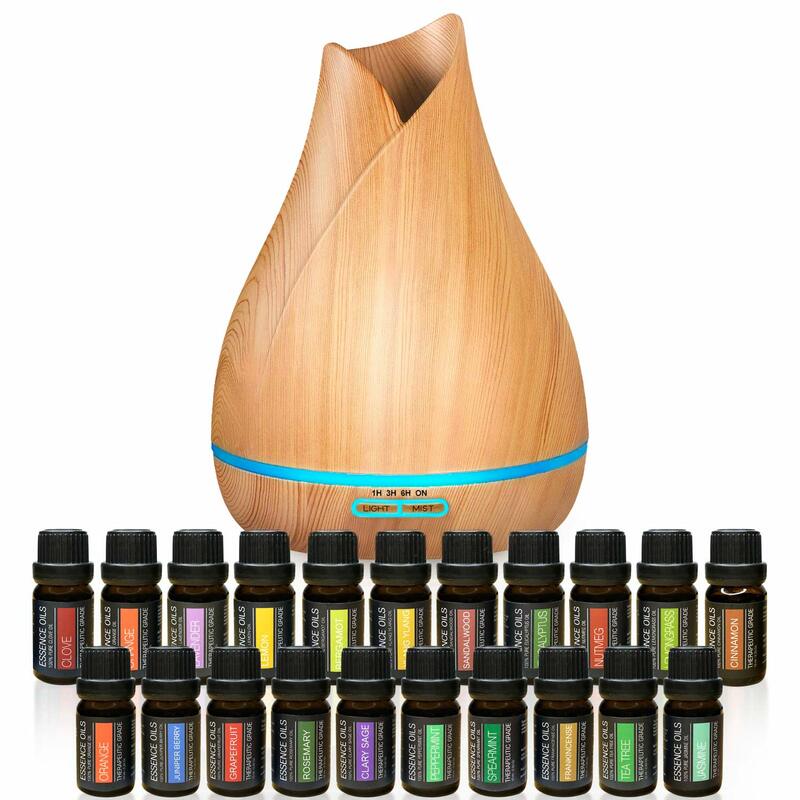 Our oil blends mix specific ratios of our 100% pure oils to create powerful effects on mind, body and overall well being. 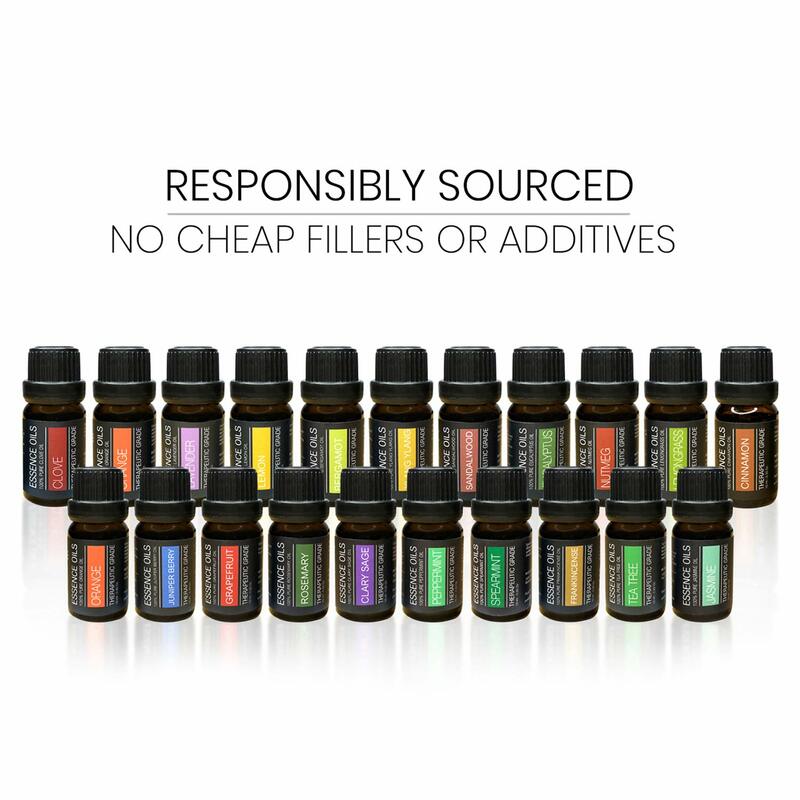 Our oils don’t have any added fillers and absolutely zero additives. We use whole leaf and root of quite a lot of common and rare plants and extract their rich aromatic oils to be used in our sets. MONEY BACK GUARANTEE – If you don’t seem to be completely satisfied with our product then return it for a full refund. with no questions asked.